It's what our customers say... and they love our interject fuel system cleaner!... (because it works!) and it's due to Interject being an organic solvent that goes straight to the bottom of the fuel tank, where the water is, and helps get rid of it, safely!! 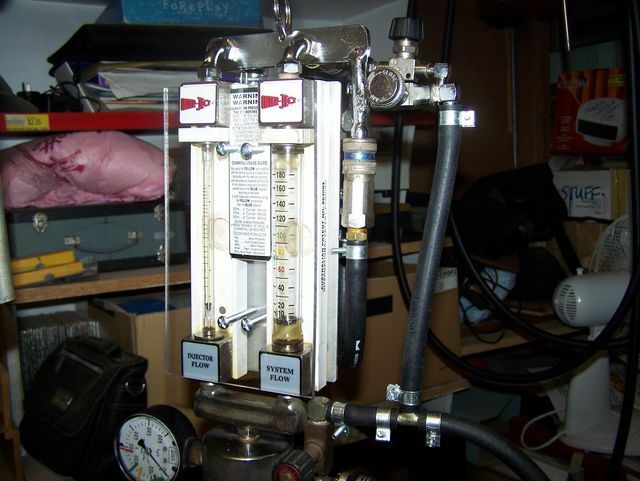 For the best interject fuel system cleaner, you can always rely on us as we have been using the Interject Fuel System Servicing Technique for over 30 years. For the last 22 years, we have also been involved in Teaching and supporting other workshops, not just in NSW but in the other States of Australia. Our success and subsequent customer satisfaction is due to our Interject chemicals cleaning the injectors and the inlet valves to ensure good engine breathing. The performance is always better than removing the injectors and just cleaning them alone, and depending on the vehicle, can also be much cheaper. We also recommend that you use InterJect (used to be labelled Interjectron) (Fuel Tank Additive) in your "Fuel Injected" vehicle every 6 months or 10,000kms (especially important, if you use Ethanol) to prevent problems with water or fuel contamination, to help maintain it, and insure that it costs you less, and lasts much longer. Special WARNING in regards to using Ethanol Blended fuel:- Due to Ethanol having an affinity to moisture, using ethanol in older Fuel Injected cars may produce problems as there will be moisture in the bottom of the fuel tank (this is a normal situation, due to the tank being vented to atmosphere and moisture gets in when the fuel is being used) Simply add 2 bottles now, and use a bottle of Interject at every service or 5,000kms.......Don't get caught with a rusted fuel system as the fuel company won't pay for the repair....as the experts know that fuel tanks rust from the inside and the moisture gets in as fuel is used up!! Just use Interject... and water contamination and damage from ethanol will be a thing of the past. Please be Aware..."We do not recommend the use of ethanol based fuels in early cars, especially where cork gaskets are in the fuel system, say the fuel pump etc. and as a general rule, to be safe, if it's a carburettor use only Premium fuel"
Modern vehicles are designed to produce less pollution. This has been accomplished by means of EFI, and the modern day vehicle does not have a traditional carburettor. EFI may seem to be more complicated, but in fact they have a simple structure. They usually give many years of trouble free operation, BUT, It is important to observe some basic maintenance procedures. This is where Inter-Ject can help you, and it can save you money. The brain of the EFI system is an ECU (Electronic Control Unit) This unit analyses the sensors on the engine, and it alters the timing of the injector openings, depending on the conditions outside ie. cold start, acceleration etc...MP or Multi-Point is the most common type of system used. Each intake port has its own injector. "Using InterJect on a regular basis will enhance the way the fuel behaves and is burned in the combustion chamber." Interject is also great in Carbi cars and diesel engines... call Harry or Brad and discuss your needs with them. This is your first defence against polluted fuel. It's very important that you change this filter regularly. The idea of the fuel filter is to remove the destructive contaminants before it gets a chance to get to your injection system. Condensation produced due to normal tank venting. Running low on fuel or running out of fuel. To help clear tarnish and build up of deposits, use the Inter-Ject additive regularly (every 6 mths or 10,000kms), (especially important if you use Ethanol as Interject will remove the water from the fuel) and have our comprehensive "Fuel System Service" done every 2 years or 30,000kms or when problems come up, like missing or poor behaviour. If you are a workshop and want to become an InterJect Reseller or Service Centre, OR... you have one of these machines, not being utilised (as mechanics come and go), we can refurbish the Interject Servicing Unit (the seals on the flow meters and hoses go hard with age and when not used) and provide quality training on "Fuel System Servicing"
We can train and support your current staff, in your workshop at a time that suits you. doing InterJect Fuel System Servicing, so that you will become profitable due to giving your customers the best behaving cars, providing great customer satisfaction. but need to negotiate the travelling fee? based on customer Satisfaction!, and with our total backup and support! "Extract from the Inter-ject Site"
"The Inter-Ject fuel tank additives and diagnostic equipment are the solution to all fuel system faults and problems. It is unlike any other system available in the marketplace. Inter-Ject is the only system that treats the entire fuel system from tank to combustion chamber. " and... "In all hydrocarbon fuels, (petrol, and diesel), small proportions of Sulphur Dioxide are present. When Sulphur Dioxide comes into contact with moisture, unavoidable in any fuel system , they combine to produce minute quantities of sulphurous acid. This causes formation of corrosion, resin, and carbon. Inter-Ject chemicals neutralise acid, suspend water, and remove resin and carbon. Restricted airflow, due to resin and carbon, is the single most important reason for lack of engine performance. The Inter-Ject system allows the technician to turn a normal tune into an environmentally friendly tune, which reduces vehicle emissions." Do you have any questions ? Contact us via email here! Special Thank you to Kevin Porter, Past Service Manager of Bathurst Mazda, who are now able to carry out the Interject Fuel System Servicing and further enhance their customer's satisfaction in today's demanding service environment, where looking after the customer is the number one priority. Special thanks to Kevin Porter, who has just recently (as of January 2018) decided to move on to other pastures, with best wishes and good luck for the future from Harry Holzmann, at BMFI. Thanks mate and good luck with everything!! in Bathurst with this equipment. 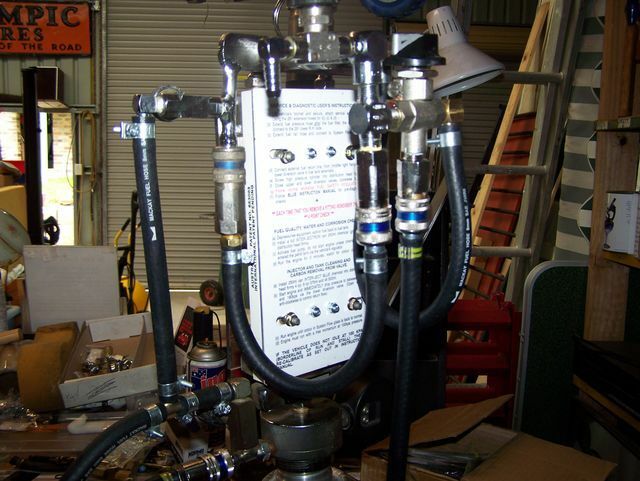 Also the Fuel System Servicing is now available at Mayne Street Automotive, Gulgong. The NRMA Service Centre at Kandos also has the Interject Machine. Also Andrew Humpries, First Choice Mechanical Repairs in Wollongong. Interject Fuel System Servicing, Call Harry as well. For website quick loading all images are in lower resolution, but, you can enhance these images? "Just Click on any images on this or any page and they will open in more detail"
New Fixed Single perspex cover protects the system flow and Injector flow units. The above 2 photos on the left, show the LB291-2F flow unit with a new perspex front cover replacing the existing 2 slide on covers that tended to deteriorate with the fuel etc.The photo on the right is the new design twin flow meter, which we can convert your existing flow unit to this new style for a bit more versatility. Using the machine without flow meter protection could be costly if you bump the flow glasses and they develop a crack and leak. If you have one of the old Interject Machine's just sitting around collecting dust you are potentially throwing away money. We can show you how to service and look after your customers who will be glad you took the trouble to encourage them to have a "Fuel System Service" done on their car. We love supporting other workshops and can come to you to train your "new"
mechanic, or just a refresher course, and show you how profitable it can be to do "Fuel System Servicing" but especially for your customer's extra satisfaction. With today's Ethanol Fuels, the need for "Fuel System Servicing" is greater than ever. Also promoting the use of the Interject chemicals is so important to be able to prevent rusting of the fuel system. Be the one to promote Interject and really look after them. Call us today! We also have posters and customer information for your office area available to help you market Interject to your customers (and also customer handouts) Just call Us! We used to have regular teaching seminars to do with the InterJect Servicing techniques and it was quite popular just a few years ago... We are going to get these happening again... If we get minimum of 6 participants we will put on a Saturday afternoon Training Seminar, here at our Dyno Workshop in Lithgow. Cost is $140.00 per person, and it comes complete with handouts and notes that you can use back in your workshop. And we also provide refreshments! Get a bunch of your mates together and we can have some fun and help you make some extra money by getting the best behavior from your customer's vehicles. Register your Interest with us by calling Harry on 0412 399 553, or Brad on 0404 490 604;, or leave a message on our workshop phone.. 02 6351 3666 if we are away from the office. If you haven't had a chance to become familiar with InterJect, you might not know that you can easily overcome water in the fuel tank by just adding InterJect. Removal of fuel tanks to overcome this problem is not required. Click on above file and download this information! These logos are loaded in Low Resolution for quick loading, Click on them for proper resolution. These Images are loaded in Low Resolution for quick loading, Click on them for proper resolution. Unlimited amout of Customers on the database and this represents heaps of customers for say a dealership. DataMechanic Invoice Page with all details kept in History etc. I have been marketing and supporting the fantastic DataMechanic Computer Program developed by Keith Craig in Londonderry, with input from many workshop sources as well as myself, now for over 20 years. Keith and I went to school together and it's just great what he has achieved. Criterior that we considered when Keith put this program together. Must be easy to use, as mechanics have more pressing things than become computer experts. Detailed information about each vehicle for easy parts ordering. Detailed History, the same as the invoice content, not abreviated. Invoices are editable, in case you forgot to charge for the air filter etc. with the advent of modern technology, we can also adjust and backup in real time with with TeamViewer-11. Comes on a data stick for remote set-up but we do provide a quick training of how the program runs, usually just 2 hours. Total cost of DataMechanic, complete with personalised Invoicing, Statements details, marketing messages etc, is $1395.00 including GST. Just a glimps at what the DataMechanic program entails and these Images are loaded in Low Resolution for quick loading, Click on them for proper resolution. Spare Parts Page with detailed information showing past buying history of individual parts! One of the reports pages of Many that are available on the Database. Detailed Invoices reports page, Statements and other usefull information to determine what monies are owed and how your business is travelling? These Images will only give you a sneak peak at what is a great program... If you are interested to gain more control of your workshop, with neat looking invoices, organise a demo from me and I can explain it in much more detail. Please remember that these Images are displayed in Low Resolution for quick loading, Click on them for proper resolution.